We are American Quality MFG and we now offer a variety of used and refurbished automated spa equipment for sale. This "automated spa equipment" may be found in health spas, modern wellness centers and day spas around the USA. Upscale tanning salon locations like South Beach, Planet Beach, and Tropical Rayz offer not only 4-5 levels of tanning beds, but also UV free spray tan booths like the Versa Spa and other "automated services" shown on the graphic. We have manufactured indoor tanning beds for the past 20+ years and we are now transitioning to more automated spa type equipment. Automated spa equipment, as the name implies, can be operated be itself, without the use of a technician. This automated equipment can be controlled by the computer at the front desk and needs very little interaction from an operator. 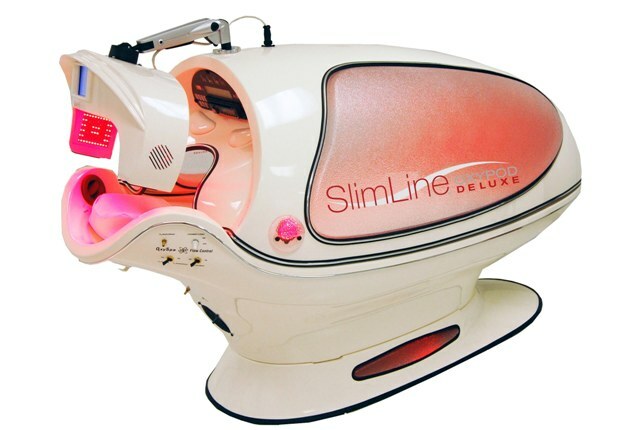 Most tanning salons in America are now "re-inventing" their business from an indoor tanning facility to a "wellness spa", "health spa", "tan spa", or "automated spa" which happens to have UV tanning devices as well. We believe the with constant pressure from the FDA, including reclassifying UV beds as class II medical devices, coupled with social media outlets casting a negative light on UV tanning, the time to reinvent yourself is now. 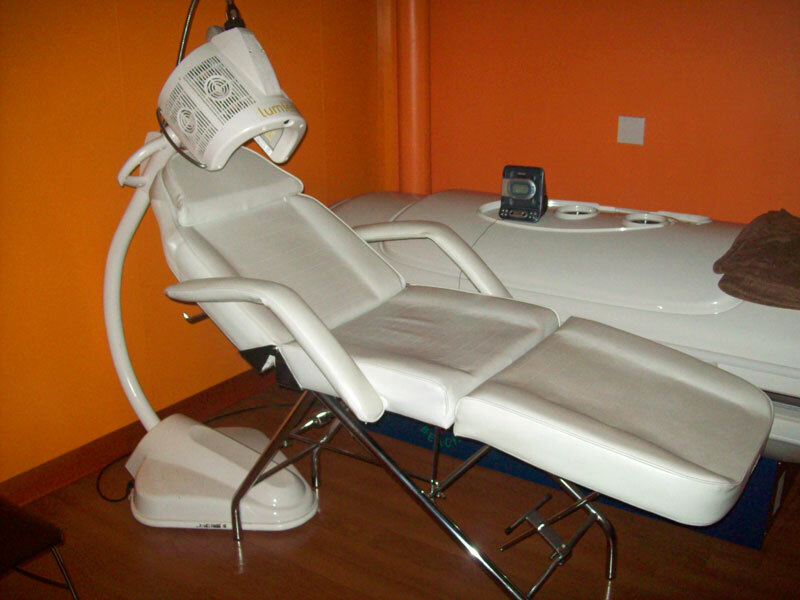 If you own a tanning salon, it is time to begin removing the old, useless beds in the back rooms and replace them with automated spa equipment like those pictured here. The automated spa equipment we recommend includes: water massage beds, sunless tanning booths, Hydration Stations, red light therapy, cryotherapy, teeth whitening, far infrared saunas, infrared body wraps, and other photo light therapy devices. All of the spa products sold from AQM are factory reconditioned with 30 day warranty and free installation east of the Mississippi. Click on any photo for enlarged view and call us at 800-667-9189 or email us here today. The main purpose of the personal sauna is to prepare or "moisturize the skin for the upcoming session". The session may be either be UV exposure in a tanning bed, UV free spray tanning, or prior to medical procedures like chemotherapy. In each case, these spa capsules or medical capsules in some cases, may provide any of the following features: moisturize skin, infrared dry heat, vibrating massage, body and face red LED light therapy, cool facial air, and aroma therapy. Please visit our main page for used Hydration Stations here. 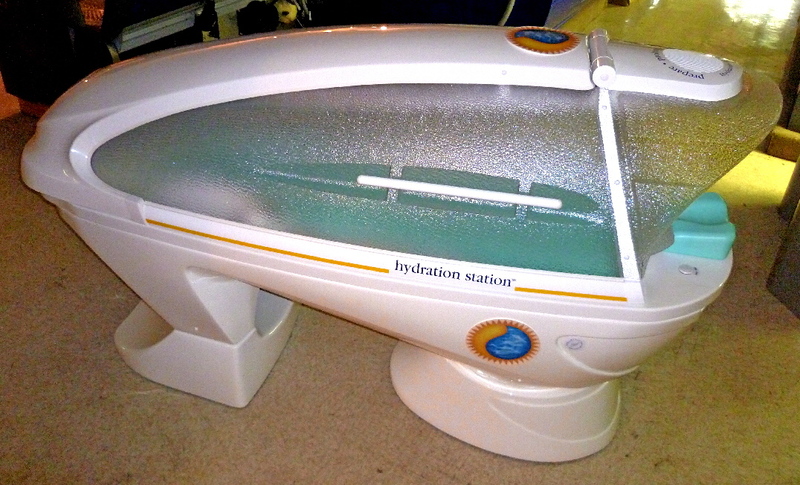 This used water massage table by Hydro Massage is the preferred choice of chiropractors and more. This model can be delivered and installed anywhere in the USA for only $8,999. 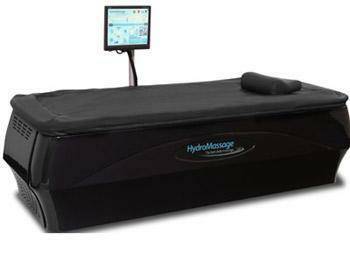 Call 800-667-9189 for more information or visit our main page for used HydroMassage beds here. The used Lumiere red light therapy machine pictured here is priced at only $4,999 and includes free delivery on the east coast of the USA. If you have not yet learned about the benefits of red light photo therapy, please click here to learn more about the healing power of light and photo light therapy. Automated Spa Equipment for Sale High Pressure Tanning Tannning Bed Lamps What is Red Light Therapy?